DnBuster's Place: Review~ A Conversation with God: If You Could Ask God Anything What Would It Be? 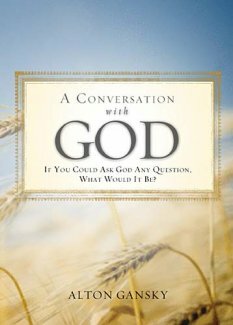 Review~ A Conversation with God: If You Could Ask God Anything What Would It Be? A front row seat to a fascinating conversation between God, Jesus, and other biblical characters answering important questions about life and faith. A Conversation with God allows readers a one-on-one dialogue with God, his son Jesus, and other important men and women from the Bible as they respond to questions and concerns relevant to the Christian faith. The questions, in some cases hard-hitting, cover issues that have troubled believers and seekers since the beginning of time. Each answer is based on Scripture and written with the warmth and intimacy of a Heavenly Father relating to His child. *God, how can we believe that You created us? *Why weren't all early writings included in the Bible? *How should we prepare for the end of the world? *Jesus, can I lose my salvation? *What will we look like in heaven? *God, does choice extend to abortion? This was a really good read! I was excited to get it and start reading ~ and it was easy to follow and read. It is set up with questions that are posed to God and then answered by God, Jesus, The Holy Spirit and various other bible figures. I enjoyed the questions and felt they were questions that many Christians find themselves pondering at some point in their walk with God. I also liked that the author did not try to explain questions from his understanding of the bible but actually backed them up with scripture. When asked “How do we know the Bible is accurate?” there are 17 references to actual scripture to answer this question. This is a great book to help you along your daily walk with God. disclosure: I received a free copy of A Conversation with God If You Could Ask God Anything What Would It Be? By Alton Gansky from BookSneeze in exchange for my review! Sounds like a great read. Thanks! I have NO IDEA what I would ask God. I have such a strong faith that God knows what he is doing and has a plan for all of us.